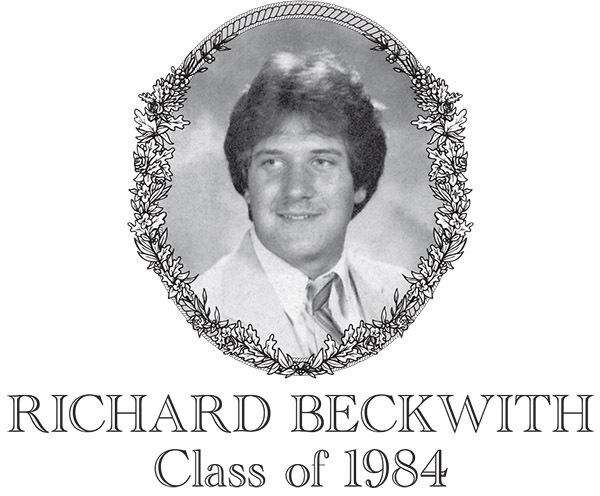 Richard Beckwith, Class of 1984, was an outstanding two-way football player. Rich had a solid junior year, but his senior season is best described as spectacular. He achieved Border Conference All-Star status, was named to the T&G Super Team and twice recognized as Central Mass Star of the Week. His numbers offensively were of a record-setting nature, and his play on defense was exceptional. Rich was a 5'11" 185-pound tailback with a punishing running style who possessed speed, power and balance, which he used to attack would-be tacklers. On the defensive side of the ball, Rich used his quickness, toughness and power to overwhelm opposing linemen. With a boxing background, Rich used his strong hands on both sides of the ball. On Offense, he would ward off tacklers with powerful straight arms, and on defense, he would use a powerful punching motion to shed blockers. In his senior year, he averaged over 100 rushing yards per game ending up with nearly 1,200 total yards and scored multiple touchdowns in half of those games. In two games against Shepherd Hill, who was considered the top opponent besides Southbridge, Rich accumulated some impressive statistics. He scored a touchdown and rushed for 174 yards in the first game. In the second game, he gained 145 yards, scored both touchdowns, kicked both PATs and was awarded the game's MVP in the 14-7 win. Against Tantasqua he rushed for 180 yards and scored 3 touchdowns. In a game versus Auburn, he scored a touchdown, amassed an incredible 212 yards rushing, and kicked the deciding PAT, resulting in the hard fought 14-13 victory. Coach Rene Langevin stated "Despite Auburn keying on him all day, he couldn't be stopped." On Thanksgiving Day, Rich carried the ball 30 times gaining 134 yards and playing spectacularly on defense. As the team's kicker, Rich went 21 for 24 on PAT attempts and 2 for 4 on field goals. However, he is best known for his long kickoffs, which routinely created poor field position for Bartlett opponents. Rich was a United States National Achievement Academy Award Winner in football. The criteria for selection are a student's academic performance, interest and aptitude, leadership qualities, responsibility, enthusiasm, motivation to learn, citizenship and dependability. Rich is self-employed and lives in Dudley with his wife Deborah and three children Regina, Sonja and Stefan.